This parkland is dedicated to the memory of those soldiers from Elmhurst who lost their lives serving in World War I. A World War I-era howitzer once sat in the center of the triangle. Howitzers, which are light-to-medium weight artillery pieces, were used extensively during World War I as a means of providing support for both air and infantry units. Many Parks properties were adorned by the excess field guns after World War I, however, at the onset of World War II they were collected and melted down to be made into to weapons. The howitzer was replaced by a plaque celebrating all Elmhurst veterans. The City acquired this land from the Cord Meyer Development Company by condemnation in 1928. The area, then known as Newtown, was developed in the 1890s. Cord Meyer and his brothers transformed it from a declining agricultural region into a middle class residential area. They laid down streets, constructed a sewer system, brought in gas and electricity, built a bank, and set up a system of trolley cars. To reflect the change in Newtown’s fortunes, and to disassociate it from the polluted Newtown Creek, it was renamed Elmhurst for the groves of elm trees in the neighborhood. Elmhurst continued to develop through the 20th century, and begins the 21st as one of the most diverse communities in the United States, home to immigrants from Asia, South America, Europe, and Africa. This property was named Elmhurst Memorial Park at the request of the Elmhurst Post 298 of the American Legion in 1928 when Parks first acquired the land. In September 1985, the park was renamed Veterans Grove. Commissioner Stern presided at the 1998 re-dedication. Between 1994 and 1996, City Council Member John D. Sabini provided over $600,000 for renovations on the sidewalks, pavements, and paths. Mayor Giuliani contributed an additional $3,000 for further renovations and sitework. Currently, there are several benches and picnic tables both inside the park and along the perimeter. 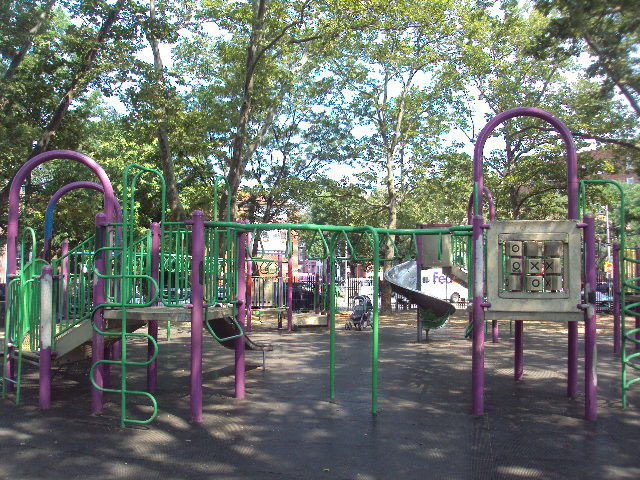 Veteran’s Grove offers Elmhurst residents a large colorful jungle gym with safety surfacing, play equipment are decorated with owl and squirrel cutouts, as well as a large tic-tac-toe apparatus.